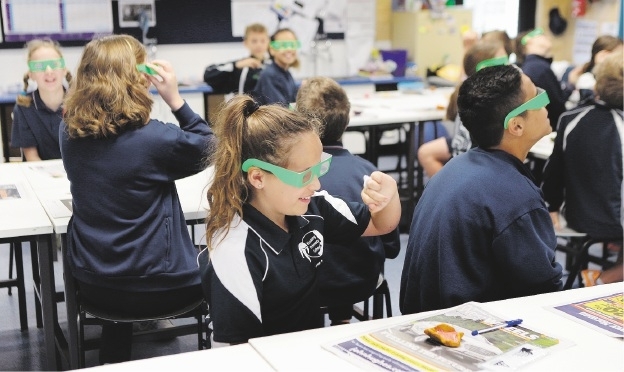 Specialist science teacher Grant Rielly said they were organised to reinforce the importance of science, not only in the school environment but also in the wider community. Among the events was a session with Earth Science Western Australia�s (ESWA) Julia Ferguson. She held a Fake a Fossil workshop where students used real fossils to test if �the present is the key to the past�. �They create a replica fossil to take home by copying processes they can observe themselves in the present,� Mr Rielly explained. Ms Ferguson also held a lesson on soils to give students a better understanding of what soil is and how to improve it. The students studied the physical and chemical characteristics of soil from around WA, using simple laboratory equipment and techniques. Mr Rielly said the science committee also set up a series of displays and activities in the school�s library so students could discover the world of magnetism, electricity, rocks, astronomy, physics and the human body. Students could construct electrical circuits, take home seeds to grow, use microscopes to study minute animal parts, experience giant crystals and geodes, look through telescopes, launch rockets and sample chemical reactions in the form of sherbet. Teacher and comedian Richard Scholes presented his show The Magical World of Crazy Science, which combined science, illusion and the arts.